The 2015 edition of this long-running series offers the same eclectic selection of repertoire as its many past confreres. Always expect the unexpected from the Husum Piano Festival, now approaching 30 years of galvanizing adventure. Jonathan Plowright was a performer once again at last year’s festival. Incidentally I was intrigued to read in Peter Grove’s happily witty and knowledgeable notes that Plowright can be seen in Meryl Streep’s recent film based on the life of Florence Foster Jenkins. He appears as a rejected auditioner for the role of her accompanist. Clearly this is Plowright’s Paderewski moment on celluloid. To Husum he brought with him Harold Craxton’s Siciliano and Rigadon. By rights MusicWeb International’s Christopher Howell should be writing about his performance (see article) but I’ll just note that Craxton manages to negotiate the supposed gulf between baroque and romantic affiliations with wonderful assurance. The Siciliano is beautifully voiced and the Rigadon brilliantly fleet and full of deft pointing. He also plays Mompou’s Segreto more warmly than the composer himself – though that’s almost invariably the case with Mompou’s late performances which are bracingly paced but sec in sound. Another Jonathan, Powell this time, also performs Mompou. identically paced to the composer’s recording of La Rue, le Guitarist et lee Vieux Cheval Powell brings out the Satie influence. Better remembered as a conductor, Issay Debrowen is represented by his deeply chromatic, post-Scriabin Poem Op.3 No.2. Yuri Favorin couples Szymanowski with Alkan. The former’s Etude Op.4 No.1 is distinctly influenced by Chopin whilst 40 ans is from Alkan’s massive sonata – slow, limpid, chorale-infused and fascinating. Hummel’s La bella capricciosa, played by the urbane Florian Uhlig, is a delightful polonaise which graduates to a virtuosic display full of pensive hesitation and strutting bravado. This was Martin Jones’ first appearance at the festival and he is represented in this anthology of performances by Carlos Guastavino’s deeply evocative La Nina del Rio Dulce. 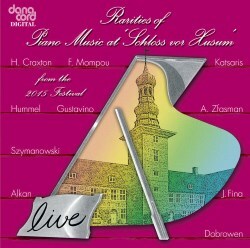 There’s only one Cyprien Katsaris and his own 18-minute improvisation – it’s called Hommage à Liszt - is a spot-the-tune cornucopia of saucy and tour de force delights. I was glad to see Alex Hassan in this company playing Alexander Zfasman’s Fantasy on themes of Matvey Blanter, who started off writing dance and jazz music in the Soviet Union. Zfasman shared his jazz interests and this Stride-based opus is a perfect vehicle for Hassan, a master of the genre. Talking of blistering, Plowright turns up to provide an envoi – a coruscating Bumble Boogie by Jack Fina. And if that doesn’t get your feet tapping, you’re dead.